50 Years at the Huntington Beach Pier "2009 Honor Roll"
Beginning with Jack Haley and Linda Benson, both Surfing Walk of Fame inductees, the campaign will profile the many great surfers who have captured championships at the famed pier over the past five decades. “Fifty Years” coincides with Surf City’s centennial anniversary. During its storied 14 year run, the U.S./West Coast Championships recorded a number of significant achievements. Jack Haley and Linda Benson walked away with the first titles, followed by Jack’s bother Mike and a Benson repeat in 1960. Over the next dozen years Corky Carroll, David Nuuhiwa, Joyce Hoffman and Benson won multiple titles and carried the torch for competitive surfing in the U.S.. The event is noted for the first coverage of Mainland surfing by ABC Wide World of Sports (1962) and Sports Illustrated (mid-60s). 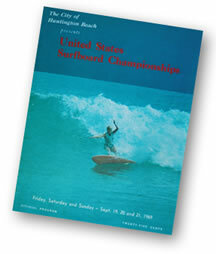 Bell became the first mainstream surf event sponsor in 1967 when competitors were required to wear helmets. Also that year, Johnny Weismuller (Olympic Champion and TV's original Tarzan) joined Duke Kahanamoku in attendance, adding to the event’s national significance. Following the “dark decade”, the venerable Op Pro Surfing Championships was launched in 1982 and took the "stadium seating" concept to new level. It created a platform for new stars of the sport—Tom Curren, Mark Occhilupo, Sunny Garcia, Frieda Zamba and Kim Mearig—all inductees into the Walk of Fame. Event Directors Ian Cairns and Peter Townend introduced the "priority buoy" and it became a standard marker at pro events. ESPN began airing the Op Pro in 1983, the first major ongoing action sports coverage on the fledgling cable network. In 1994, the U.S. Open of Surfing replaced the Op Pro and drew 200,000 spectators over two weeks. The event would quickly grow to become the world’s largest professional surfing contest, drawing record numbers of competitors, crowds and media coverage. A new list of champions would be carved into Huntington Beach lore as Shane Beschan, Kelly Slater, Rob Machado, Andy Irons, Lisa Andersen and Layne Beachley won titles in the ‘90s. Stephanie Gilmore, C.J. Hobgood, Cory Lopez, Sophia Mulanovich and Chelsea Georgeson are among this decade’s champions. 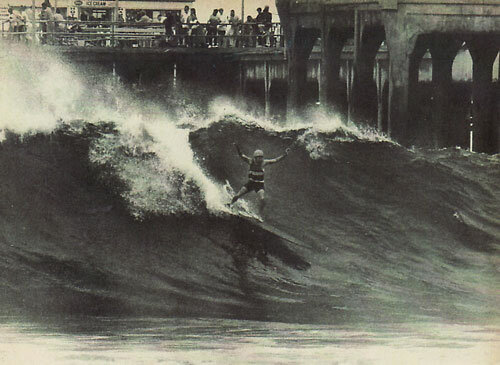 Duane, known for fearlessly navigating the pilings of the Huntington Beach Pier, opened the first shop in Huntington Beach under the pier and eventually funded his own surf team "The Hole in the Wall Gang". Back before there were surf contests at the pier, surf magazines, surf movies and surf shops in Huntington Beach, Gordie was among several pioneering surfers who loved the waves at their pier and got together to form the HB Pier Surf Club. In 1959, at the age of 15, Linda became the youngest contestant ever to enter the International Championship at Makaha…and won. That same year she became the first woman to ride Waimea when she borrowed a board from the shortest guy surfing with her, paddled out and caught a couple of waves. 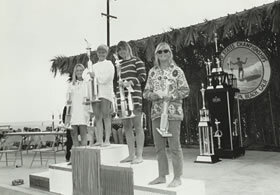 Linda went on to win the first U.S. Championship at Huntington Beach, and continued to hold her title in '60, '61, '64 and '68–setting the record for number of wins. Surfing has been part of Linda’s life for nearly 50 years. She continues her passion for surfing by teaching at “surfHER” surfing school in Encinitas, California. Linda is dedicated to providing women of all generations and abilities the opportunity to engage in the spirit and camaraderie of surfing. Founded on May 28, 1994 by honoring Duke Kahanamoku as the Father of Modern Surfing, the Huntington Beach Surfing Walk of Fame marked a historic addition to “Surf City USA.” Each year, the Walk of Fame’s selection committee conducts ongoing research through surf associations, museums and media venues around the world to compile a comprehensive ballot of qualified candidates. Every inductee receives a granite stone embedded in the sidewalk (PCH side) in front of Jack’s, the Surfing Walk of Fame Patron. PHOTO: Bud Brown (Dewey Weber & Linda Benson 1960 Championships.